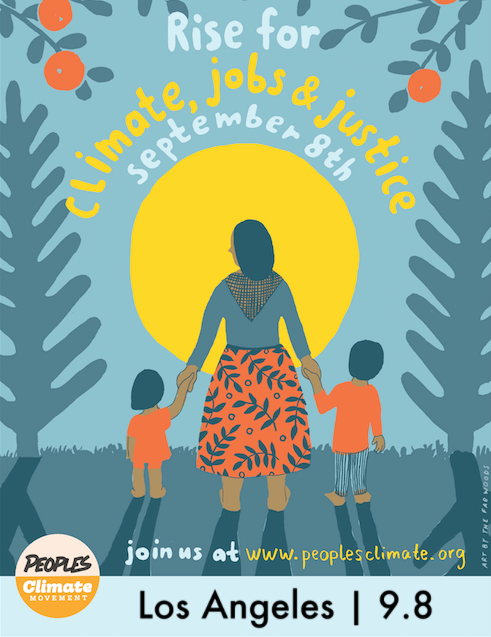 On September 8, the national Rise for Climate Day of Action is bringing people together for Climate, Jobs, and Justice, calling on state and local elected officials to take aggressive action on climate change, protect frontline communities, and create good jobs in the clean energy economy. We ask that you join us to Rise Together in Los Angeles on September 8. In solidarity with events in San Francisco and around the country that same day, we'll be focusing here in Southern California on the need for a 2500-foot health and safety buffer between oil operations and homes and schools. Millions of Californians live within half a mile of an oil rig! SoCal 350 is joining Esperanza Community Housing Corporation, the STAND-LA Coalition, People Not Pozos, Idle No More SoCal, ANSWER Coalition Los Angeles, South Bay 350, 350 Conejo/San Fernando Valley, WilderUtopia, and American Indian Movement Southern California, and others to bring our LA Community together in calling for a fossil-free world and a just and rapid transition to 100% Clean Energy. Interested in signing on your organization or group as a supporter? CLICK HERE. 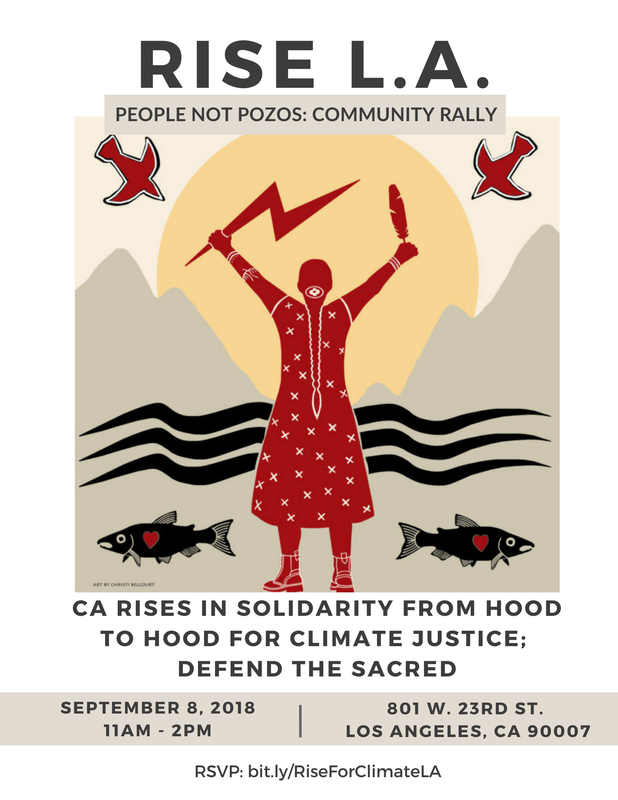 A public demonstration calling for an unwavering statewide commitment to no new permits for oil or gas drilling or fossil fuel infrastructure, and a just transition to 100 percent clean, renewable energy. We therefore demand that City, County, and State leaders protect our kids, families and communities by ending the dangerous, discriminatory practice of urban drilling through the establishment of a 2,500 foot health and safety buffer around oil well sites. We also call for the shutdown of AllenCo oil company operations in South LA, and the owner of the land, the LA Archdiocese, to prioritize community health over profit. It took three years to temporarily shut down AllenCo's drilling site near USC, who operated 21 oil wells right next door to low-income housing, day care centers, and numerous schools and colleges. Neighborhood residents suffered from serious health problems because of toxic fumes emanating from the site. And now, despite these health and safety violations, AllenCo is attempting to reopen the site. AllenCo is only one of dozens of toxic fossil fuel sites in Southern California. Thousands of Los Angelenos will stand with climate advocates worldwide for this global day of action ahead of the Global Climate Action Summit in San Francisco. If you aren't driving north for September 8th, please join us!